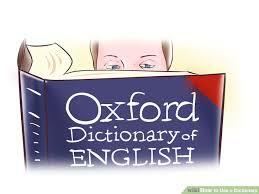 Every person should learn to use a dictionary in his speaking and writing as well as in his listening and reading. Its use for checking pronunciations and clarifying meaning is often taught in the high school up to the university. Smith and Johnson (1980) state a dictionary is a reference book containing an alphabetical list of words and their definitions. It is also contained words meanings, pronunciations, grammatical functions and sometimes word origin and sample use. Hasna (1999: 20) writes that a dictionary is the best resources to increase our vocabulary or to understand the word meaning when it comes across in the text or in comes in the text or in conversation. It is necessary to use dictionary when a word meaning can be determined by studying context, analyzing word structure or referring glossary. Belum ada tanggapan untuk "The Important of Using a Dictionary"